Bulldog Motocross Apparel represents the true spirit of the motocross racer's dedication, fight to death and never say die attitude! That's awesome to see RC4 and Hart out there! Wow, candid comments about the WMX! Decoster talks about him pulling off the track in this video, like always he tells it like it is! Will Roczen choke with only a 5 point lead and his confidence shaken at the last round not making the main? LOL! That is pretty lame for sure. That's cool, at least we get to see him ride one more time! I saw a post on facebook that Millsaps will miss the outdoors due to knee surgery? That's awesome!! Great to see one of ours having real success in Nascar! 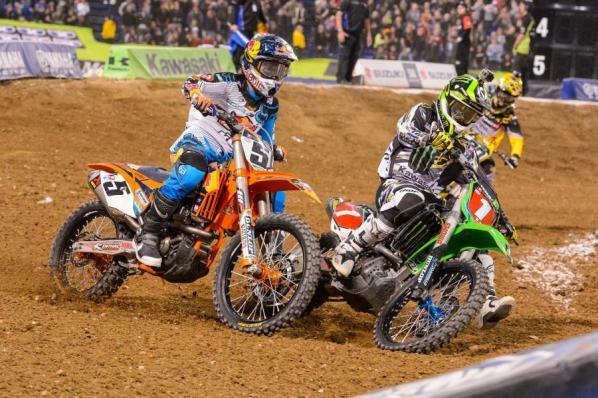 The Dungey pass on Villopoto: Was that Villopoto being conservative or has The Dunge turned up the aggressive meter? Man I wanta go, looks fun! Mike Tyson said everyone has a plan until they get punched in the face! Great news, it would be cool to see him again! In my top 5 favorite riders of all time! Wardy was the man!!! Should Roczen ride the 350 in the East SX? There should not have even been a penalty to begin with. Look closer, he rolls the jump directly after the flag and then doubles the next jump. The red cross flag is to protect someone on a blind jump, everything after that is wide open. You guys should put on a celebrity boxing match for charity!